Tajikistan is a landlocked, lower middle-income, food-deficit country with a population of approximately 8 million, three-quarters of whom live in rural areas. The mountainous landscape confines the arable area to just 7 percent of the country’s surface and poses enormous challenges to food security during the winter season. Despite improving food security in recent years, only 24 percent of Tajikistan’s rural population is food-secure and 50 percent are marginally food-secure. The majority of the population spends between 70 percent and 80 percent of their income on food, yet around one-fifth of the population is affected by food insecurity. According to findings of the 2015 Global Hunger Index and FAO, Tajikistan tops malnutrition among the former Soviet republics, and 33.2 percent of Tajikistan’s population is suffering from undernourishment. In 2014, Tajikistan reported to have the sixth highest rate of tuberculosis (TB) in Europe and Central Asia. The country is the poorest in the Commonwealth of Independent States, with 47 percent of the population living on less than $1.33 a day and 17 percent on less than $0.85 a day. Tajikistan ranks 129 out of 188 countries on the Human Development Index. School meals – WFP provides daily school meals to 370,000 students in more than 2,000 schools in rural areas—covering more than 54 percent of all schools in the country. Since October 2013, WFP has supported activities to build the Government’s capacity, particularly in the financing and managing of a nationally-owned school meals program, which aims to assist vulnerable food-insecure communities in rural areas. Since the beginning of 2016, WFP has been assisting the Government in drafting an actual national school meals program. 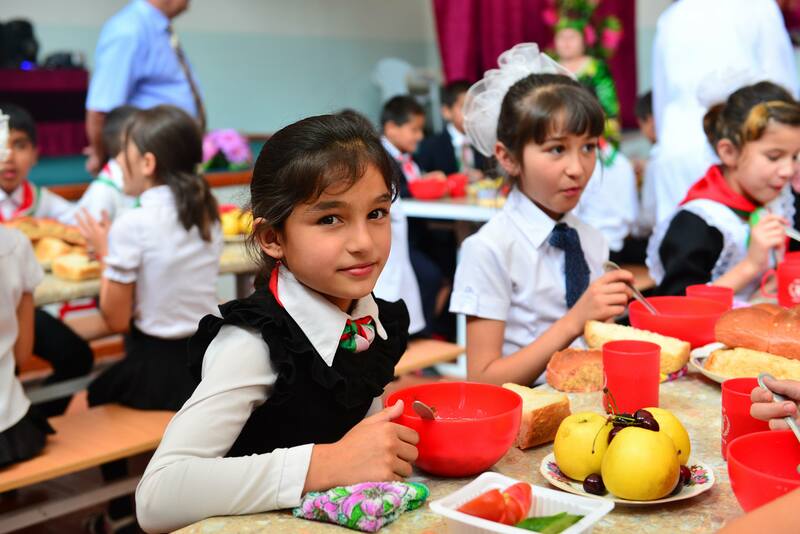 The UN agency, in cooperation with its technical partner Russian NGO Social Industrial Food Services Institute, has implemented activities to improve nutrition indicators and enhance the management and service of school meals through various time- and cost-effective models. Food assistance for assets (FFA) – WFP helps meet immediate needs of food-insecure people while building community assets. Using food, food vouchers or e-cards as an incentive, communities build and repair infrastructure that helps reduce exposure to and impact of shocks, strengthen resilience to natural disasters and contribute to sustainable livelihoods while ensuring environmental benefits in one of the most vulnerable countries to climate change. By the end of 2015, FFA projects resulted in a total of 33,500 cubic meters—or more than 1.2 million cubic feet—of dams to protect arable land, the rehabilitation of 530 classrooms, reparation and construction of 29 bridges and 265 water supply systems. New FFA activities are expected to be implemented in the coming months. Treatment and prevention of malnutrition – Every year, more than 5,000 children are enrolled in a WFP-supported supplementary feeding program treating moderate acute malnutrition in selected primary health care centers. WFP’s nutrition programming is focused in the Shartuz and Kulyab districts of the Khatlon region, where malnutrition rates are high. The UN agency undertook the process of developing guidelines for integrated management of acute malnutrition and is working to scale up the prevention of chronic and acute malnutrition. In May 2016, WFP completed assessments of health facilities and preparatory work to resume nutrition activities in the following months. Support to patients with TB – In 2015 WFP provided assistance to 13,310 males and 12,095 females through its TB project. With the support of WFP, the Ministry of Health and Social Protection and the TB Control Center adapted nutrition assessment, counseling and support guidelines into a practical guidance manual, which will serve as a reference document for TB treatment in Tajikistan. The National Tuberculosis Centre took over from WFP assistance to in-patients in January 2015 and will provide financial assistance to out-patients and their families by 2021. WFP is currently negotiating with the Government and donors, specifically the Global Fund, to resume programming and activities. Emergency response – WFP supports Tajikistan’s emergency preparedness and response system, working with the Government’s Committee for Emergency Situations and other relevant agencies. Based on its solid experience in this sector, WFP is an active member of the national Rapid Emergency Assessment and Coordination Team and contributes to achieving the objectives of the National Platform for Disaster Risk Reduction. WFP responds to natural disasters and emergencies through emergency food assistance and relief interventions. To ensure readiness in the case of rapid onset emergencies, a contingency stock is foreseen for targeted distributions for an initial period of three months.